bScary: Bad storms, fear that Nim's father is lost at sea and dead. Also Nim gets a horrible wound and there is fear of infection as she is alone on the island at the time. 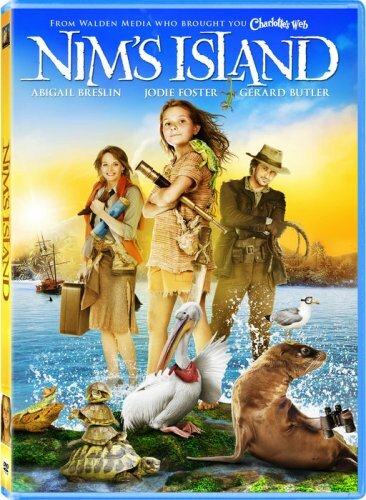 Nim’s Island stars the prolific Abigail Breslin, and Jodie Foster (who to me looks more and more like Helen Hunt every day). The basic premise of this story is that a widowed marine biologist and his daughter, Nim, live alone on a deserted island which he discovered. Nim loves to read, and her favourite stories are the light, fluffy adventure stories starring hero Alex Rover, which are written by, well, Alex Rover. Nim’s father disappears at sea during a storm, and through a twist of fate (or rather script), in reading email she finds an email to her father from none other than Alex Rover, the hero of her dreams. A series of events – a bad storm, an injury, being a child alone on an island – leads Nim to ask Alex Rover for help, eventually imploring him to come to the island. The only problem is, unbeknownst to Nim, Alex is short for Alexandra, and far from being the fearless, hunky male hero that she imagines him to be, Alex(andra) is a female New York novelist with – wait for it – agoraphobia. She hasn’t been out of her apartment in years. The rest of the story is about overcoming adversity – in Nim’s case, being alone on the island while eventually coming to believe that her father is dead (he isn’t) – in Alexandra’s case, fighting to overcome her fear of the world, and leaving her house to go help this young girl to whom she has grown attached through their email communications. However, there are moments that will probably be too intense for younger children – the storm is scary – it almost blows the house over, and things are flying all across the room, and Nim is all alone during it (well, save for her pet sea lion and seagull). There is also a scene where Nim gets a very nasty wound on her leg. Also, at the very beginning of the movie, there is a scene where Nim is daydreaming the opening scene of the newest Alex Rover book, and in it he is being held captive by gun-wielding bedouins. This isn’t a stellar movie – not nearly like Wall-E or Kit Kittredge. But still, if it’s hot out, it’s not a bad way to spend a couple of hours in an air-conditioned theatre with a child of, say, 8 or older.